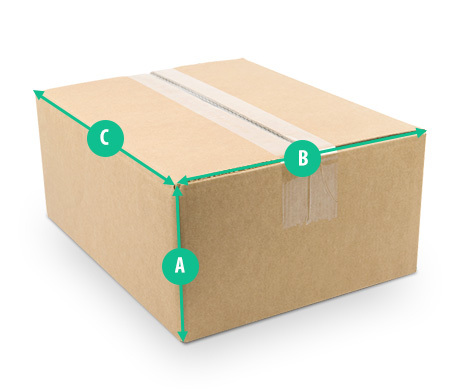 Standard packages are packages with a circumference of maximum 300 cm which is calculated as follows: Multiply the two shortest sides by two and then add the longest side. The sum of the height x 2 (A) + the width x 2 (B) + the length x 1 (C) cannot exceed 300 cm and the maximum weight is 40kg. Moreover, the longest side (C) cannot exceed 200 cm. Standard packages should be packed in a cardboard box (preferred packaging) constituting an integral whole, wrapped in stretch film, reinforced with tape and marked with the address and contact phone number of the receiver. Consignments which are not packed in a cardboard box (bags, suitcases, etc.) are not fully insured, which means that only the content is insured and the insurance does not cover mechanical damage of the packaging. · All electronic equipment (computers, laptops, monitors, household appliances, audio/video devices, etc.) must be in their original packaging properly prepared by the manufacturer for road transport. Every time the packaging is not the original packaging, we shall ask you to confirm the following statement: ”I consent to dispatch at my own risk”. · Glass transported in packages is not covered by insurance (jars, glasses, lamps, etc. ), unless it is in manufacturer’s packaging suitable for road transport. Glass in its original packaging, but packed in one package together with other items, is also not covered by insurance. Glass and other goods requiring particularly careful handling (e.g. because they are particularly fragile or can be transported only in vertical position or lying on a certain side) are not covered by the insurance and shall be dispatched at the sole and entire responsibility of the client. · All pharmacological and pharmaceutical products (medicinal products, food supplements, foodstuffs, milk powder etc.) must conform with the requirements and permissions of the relevant country. Consignments of any of the aforementioned products shall be accompanied by receipts/invoices/necessary purchase documentation indicating their composition and contents (in the case of medicines, the Latin description should be enclosed). · Automobile parts such as rims and tyres: Tyres/rims packed two by two can have a total weight of maximum 50 kg on an international route, 30 kg on a domestic route, and must be transported according to the applicable rules. The standard consignment insurance is of up to €300, no additional insurance can be purchased.